The Pradhan Mantri Awas Yojana is a governmental scheme launched by the Ministry of Housing and Urban Poverty Alleviation (MoHUPA) to address the shortage of housing options for 20 million or so slum dwellers. With the current urban growth trends, the demand for housing solutions that are affordable for low income groups will continue to grow. By 2022, the ministry’s aim is to provide viable housing financing solutions to the urban poor. This scheme covers the Economically Weaker Section (EWS), Lower Income Group (LIG) and Middle Income Group (MIG). The CLSS scheme falls within the wider ambit of the PMAJ program and is implemented as a central sector scheme. The CLSS scheme has been implemented as way to channel institutional credit flow to the urban poor. Two main agencies are entrusted with the responsibility of implementing the CLSS scheme: the National Housing Bank (NHB) and Housing Development Corp (HUDCO). A grand total of 185 primary lending institutions have been registered under this scheme. Housing Finance Companies (HFCs), make up a good portion of them. When speaking of the beneficiary family, it includes the husband, wife and any unmarried children that they might have. However, any adult who is earning an income will be treated as a separate family, regardless of whether they are married or not. This scheme covers every statutory town included in the 2011 Census, as well as planning areas notified with respect to these towns. For EWS and LIG sections, CLSS will be applicable only on loans of up to Rs. 6,00,000. Beyond Rs. 6,00,000 the loan will be available at a non-subsidized rate. This Scheme can be availed by beneficiary families for acquiring newly constructed houses. It can also be used by families for incremental housing, i.e., adding a kitchen, room or bathroom to their already existing house. A house of carpet area 322 square meters for EWS groups and around 645 square meters for LIG sections will be eligible for this subsidy. For MIG I, a subsidy of 4% is provided for loan amounts up to Rs. 9 lakhs, while for MIG II, a subsidy of 3% on interest rates has been provided for amounts up to Rs. 12 lakhs. For MIG groups, construction of houses of carpet area up to 968 square metres and 1184 square meters will be eligible for this subsidy. This includes purchase and construction of houses. The subsidy will be provided for these groups for either a maximum of 20 years or for the duration of their loan, whichever is lesser. It will be calculated at a rate of 9% Net Present Value (NPV). 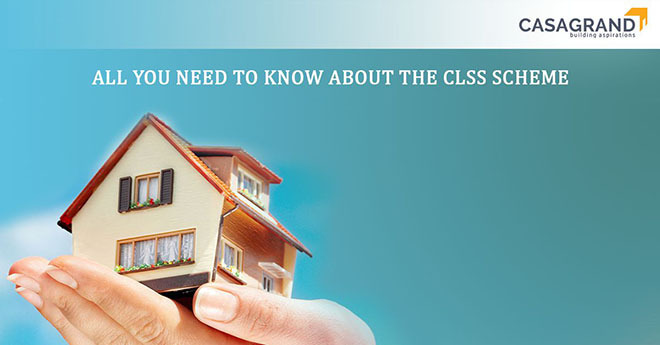 CLSS is a landmark scheme by the Government towards making housing affordable and accessible to all income groups. If you’re looking for high-quality, beautifully constructed houses in a wide range of price groups, visit Casagrand.